Opening next December 17 Liverpool FACT (Foundation for Art and Creative Technology) will host an amusing exhibition on the influence and widespread circulation of virtual spaces and videogames in the contemporary society. 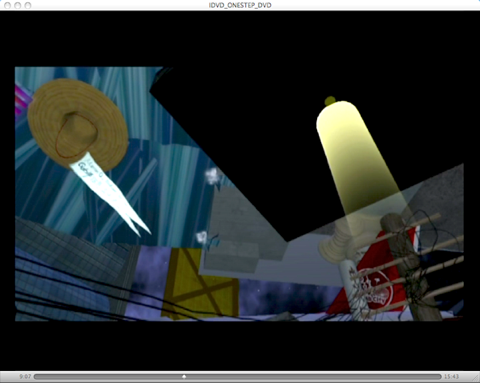 Among other artists and projects, ‘Space Invaders: Art in the Computer Game Environment’ will also display Cao Fei’s 2004 COSplayers, a film installation following the ‘epical’ performances of some teenagers miming their favourite anime. The exhibition analyses the way in which the virtual invades our everyday life and how this affects our behavioural and mental performances. Somehow these external stimula act upon our spatial and visual perception (to the point where die-hard fans of Tetris can contract a strange ‘imaginary disease’, ‘Tetris syndrome’, no need to mention this, where they believe that the world around them operates under the logic of the game…! ). As long as you don’t get to confuse reality with games (threatening people with your ‘augmented reality’ umbrella, flying from the CCTV to the Bird’s Nest, grabbing objects and people and trying to put them in the right shape to fit a small space…! 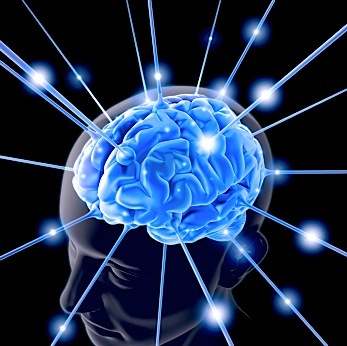 ), virtuality could therefore become an important research and medical instrument. ‘Your City is Mine, My City is Yours’ – ‘Better City, Better Life’ Shanghai Expo meets RMB City values. Opening next May 2010 Shanghai Expo is expected to be one of the major social, cultural and political Chinese appointments of the last few years, if only for the huge sums of money poured into the event and its symbolical significance as the first international expo taking place in a developing Country. 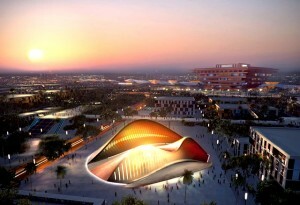 Shanghai Expo will become a platform of exchanges and discussions on social and urban issues such as the environment, pollution, ecology, cultural heritage, Chinese customs, science and technology and the remodeling of communities in the city. To what extent these RL values can be applied to a virtual environment? Are these issues somehow also relevant in SL and RMB City in the specific? On-line worlds are not threatened by pollution and ecological alarm, they’re also dispensed with the increasing problem of traffic and lacking of livable places. Nonetheless, virtual worlds, and RMB City amongst them, are based on an aggregate of people and some shared values, interests and dreams. The theme of Expo 2010 ‘BETTER CITY, BETTER LIFE‘ shares the same implicit utopian urge incidental to any real and virtual society. In Shanghai as well as in RMB City history and the past blend with progress and the future, ancient values and traditions find their way amongst modern models and new standards of life and Chinese paradigms overlap cosmopolitan issues. 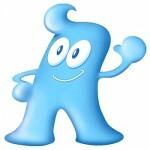 The funny mascot of Shanghai Expo, ‘Haibao’, reminds the Chinese character for ‘people’ (人)(http://www.easytourchina.com/china-specials/emblem-mascot-of-shanghai-expo.htm) and our virtual city is ‘People’s City’, a city built on and made of any individual contributions, made of persons and their dreams. The only hope we have for a better world is to use our imagination to invent a new one. 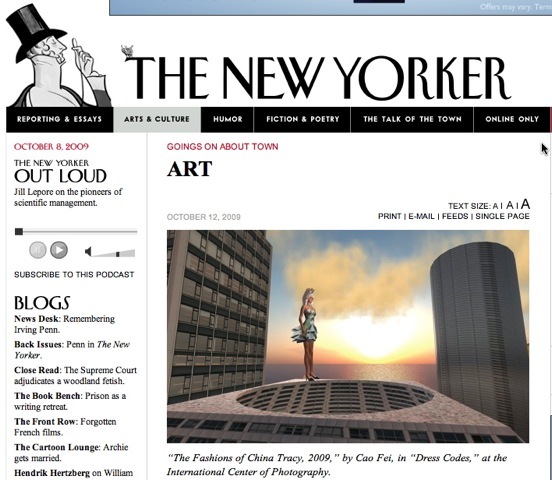 This year New York major exhibition focuses on the theme of FASHION and presents a wide range of projects relating to this ‘minor art’ and its connection with other artistic media and cultural phenomena. Exhibiting over 100 recent works by 34 artists from 18 countries, ‘Dress Codes’ explores the realm of fashion as an artistic expression and a sociological manifestation. As a multilayered language, infused with cultural, anthropological, historical and social meanings, clothes, apparels and accessories define one’s external identity and contribute to the construction of one’s social self. 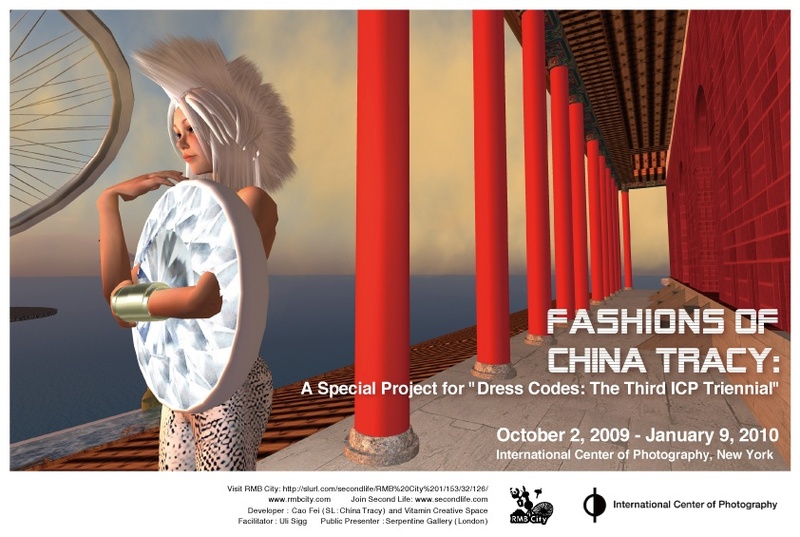 ICP created its own charming avatar for the show, a beautiful and intriguing ICP Seda, who, through in-gallery computer stations, presents China’s Tracy costumes in the world or RMB City. 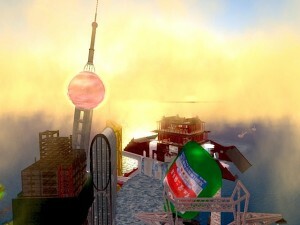 A fantastic, exciting and unpredictable journey, the video ‘Live in RMB City’ follows the first breaths, fears and curiosities of newly born China Sun, the baby of China Tracy, in Second Life. The camera follows baby China Sun’s wanderings and explorations in a revived RMB City, inspired by brand new additions created by a team of artist, writer, architect, and philosopher collaborators, and infused with a fresh stream of life. 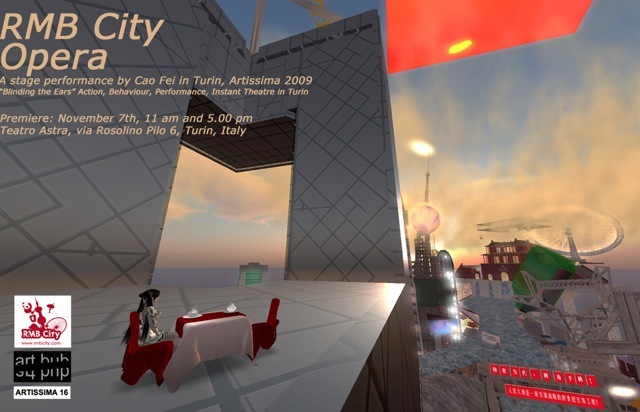 Commissioned by Tokyo’s Shiseido Gallery for a 2009 Cao Fei solo exhibition, ‘Live in RMB City’ is a dreamy children’s tale on the mysteries of (real and virtual) life. Accompanied and instructed by the attentive guidance of an extravagant cyber-mother, RMB City’s newest born baby wonders through old and new buildings, weaving the net of an articulated journey between past, present and future. As a new stage of its ever-changing life, RMB City takes part in Artissima 2009 with an experimental theatrical play inspired by the ‘Eight Models Drama’ theatre, typical of the Chinese Cultural Revolution. On the borderline between past and future, between classic and contemporary realities, the performance will explore the connections of real and virtual identities, using both physical and virtual spaces as a stage for interaction between actors and ‘avatars’. Reflecting on the new meanings of the term ‘model’ in contemporary society, ‘RMB City Opera’ will present itself as a reflection on current forms of urbanization and new millenium’s identities. Citizens of the old and new worlds, you are warmly welcome to join the show! November 7th at 11.00 a.m. and 17.00 p.m.